Austin — Cool, sunny weather and hot music brought the crowds en masse to the opening show of the Ninth Annual Texas Community Music Festival Saturday. Opening act, festival host Austin Civic Wind Ensemble, set the tone with a lively preview of their upcoming Spring show, dedicated to music by French composers. 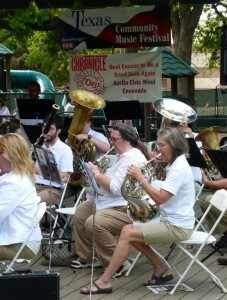 Hill Country Community Band of Marble Falls, the Austin Jazz Workshop,Vagabones, Central Texas Community Trombone Choir, Hot Club Soda land Bamako Airlines rounded out the day’s festival lineup. Evening was headlined by Rattletree Marimba, a four piece Zimbabwe-inspired marimba ensemble that filled the dance floor with Joy! Sunday’s program begins at 10:45am, with Lee Jastera, followed by a return appearance from Greenville’s Trombonium Sinfonium. The program also features a performances by the acclaimed Austin Lyric Opera. Please check the schedule for the entire Sunday schedule. The forecast calls for ZOMBIES!